One of the themes of Purim is friendship and unity. When Haman asked King Ahasuerus for permission to destroy the Jews, he said "There is a certain people who are scattered and separate…" In contrast, Queen Esther knew that Jewish unity was essential when praying for G‑d's help. She instructed Mordechai to "Go, assemble together all the Jews" for fasting and prayer. G‑d is our father, and He loves nothing more than seeing His children unified. When we are united, we merit G‑d's blessing and salvation. We give gifts of food on Purim to strengthen our bonds of friendship with our fellow Jews. 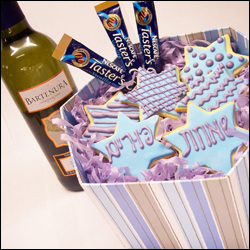 Click here for more information on mishloach manot. Wishing you a very happy Purim and a Shabbat Shalom, and I hope you take this as a virtual Mishloach Manot! Book of Esther ch. 9. Why Isn’t G‑d’s Name Mentioned in the Megillah? Why Is It Called the Fast of Esther? On a Friday Purim, when do I perform all the day's mitzvot? How Could Esther Marry a Non-Jewish King? Purim Gifts to the Rich? Should we be giving mishloach manot only to the poor?